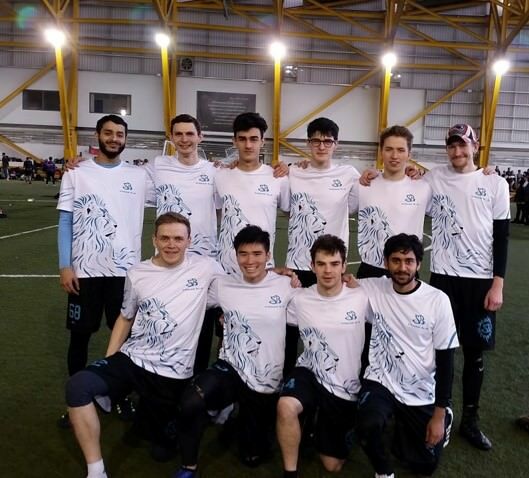 At indoor regionals last term, we finished 4th in the East and London region and qualified for Division 2 Nationals in Glasgow. In our initial pool, we had Bangor, Bristol, and Strathclyde 2 and our first game was against the Scottish team. Strathclyde played what could probably be described as typical Scottish indoor ultimate with a reliance on scoobers and blades. Unfortunately, they just didn’t have the required completion rate to really put up a fight and we ended up winning 9-3. We played Bristol next who played with a more similar style to us with more handler movement and the occasional blade or hammer. We were winning but didn’t quite see out the end of the game properly and lost 8-7. Nothing quite worked out for us when playing Bangor and we lost 8-3. Sometimes, especially in indoors, games just get away from you. With our two losses, we went into the lower power pools with Strathclyde and joined Warwick 2 and Liverpool John Moores. I’m always impressed when a club can get a second team to nationals but Warwick 2, just like Strathclyde 2, didn’t have quite enough to dictate the game and we won 8-5. Our last game of the day was LJM. A couple basic errors meant we went down a couple points early on and could just never get them back, even with the 22 minute games. It became a shootout and the 10-8 score was tied for the highest total score of a game in the division. Fortunately, LJM lost to Strathclyde by 2 points so we actually won the power pool on points difference. On Saturday night we had a Chinese buffet. MC let himself down. Enough said. Old rivals Sussex were our opposition in the crossover. We came out hard and went up 3-0 which is one of the more fun things that can happen when you’re the lower seed in a crossover. Unfortunately, we gave 2 of those breaks back immediately to make it 3-3. But we didn’t crumble and kept playing decent (enough) indoor ultimate. Both teams fought hard but we managed to come out on top 7-5. We were the only lower seed to win our crossover. It was pretty great. Having taken Sussex’s 7 seed, our quarterfinal was against 2 seed and power pool winner Heriot-Watt. And we smashed it 7-2. They were obviously a strong team, but whether it was not having a crossover or just not having a good game, it didn’t go well for them at all. This was also one of our best games as far as not turning over the disc goes. It makes a huge difference apparently. So it turns out that our initial pool had 3 of the top 4 teams. The UKU seedings never let you down. The fourth, and our semifinal opponent, was Nottingham. This was just a good game of indoor ultimate. There were only a few turns, both teams got one break each and the game finished 8-7 to Nottingham who had started on offense. It was one of those games where you’d like a bit more time in order to separate the teams. They had a U24 player with some incredible around blades which possibly won them the game. They went on to win the final. The 3rd place game was a rematch with Bristol who had just lost their rematch against Bangor. We hoped to come out strong and get them while they were down (or at least, we assumed they’d be down) but it turns out that silly turnovers on the first few points ruins that plan. Like a-dropped-clap-catch-on-an-open-swing-silly turnover. We went 3-0 down before sorting it out to trade for an 8-6 loss. Obviously it would have been nice to come home with medals, but we had a good time. It’s still amusing to think we came 4th place when we only won 4 of 9 games. I know not all games are equal, but Leeds won 7 of 8 games to finish 5th. Indoors is weird.